I’ve written previously about my trip to Intelligentsia Coffee and how getting lost on the way prevented my good friend Jonathan from being mugged. I should also state that I recently had my bottom two wisdom teeth out (in three and two large pieces, respectively), which has prevented me from drinking alcohol. For the first two days, I couldn’t even drink coffee, which was a relative purgatory for me. I had the opportunity recently to tour Intelligentsia’s new LA roasting facility in Glassell Park (near Glendale)–my family might be opening a coffee shop sometime soon, and we wanted to take a look at different coffee wholesalers. Let me tell you: it was awesome! The wine analogy would be like visiting a wine cellar–not the vineyard, where the grapes are grown, but the place where the wine is actually fermented and bottled. Five thousand square feet of roasting machine, tasting equipment, office space, sacks and sacks of green coffee beans (which are extremely hard, odorless, and tasteless, actually), and bags and bags of freshly-roasted coffee. The air was permeated by a delightful warm coffee smell, as if I were in the middle of a perpetual breakfast. Intelligentsia’s pretty damn serious about their coffee. 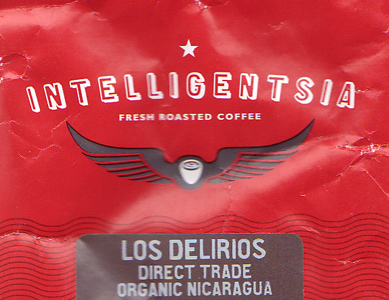 For a look at the majesty that is the Intelligentisa roasting plant, click here. Previously, we also ordered samples from Bluebottle Coffee Company in Oakland, California: their Bella Donna blend and Mexican Chiapas. We also had samples from Peet’s: their Finca San Sebastian Guatemala, Indian Peaberry, and Arabian Mocha-Sanani. All in all, we had 10 different varieties of coffee. Generally, the Peet’s coffees were the darkest in roast, with Bluebottle and Intelligentsia much less so. These were all South American coffees. The Arabian I found to be a bit too intense and funky for my tastes, and the Bella Donna and Mexican Chiapas were a bit too insubstantial. The San Sebastian was the darkest roast of my three favorites–I wrote about it in a previous post. The Los Delirios was mild, with caramel notes and clear, pleasant acidity. I would probably pick the El Machete on any given day because it’s a nice medium-bodied coffee with hints of berry and a slight jamminess, offset by focused acidity. Overall, a very good cup that would be able to ease even the sleepiest man into work. For those of you wondering if this is a coffee blog or a wine blog, don’t worry! I expect to be drinking a lot more in law school, which is coming up in about a month and a half. Accordingly, I will be moving out to DC for my first semester sometime in the beginning of August. Regardless, I hope there’s room enough in this world for all manner of beverages! Thanks for adding me – you voted for the wheat beer didn’t you! I’ve added you as well btw.